It may have taken 11 weeks, but the St. Paul football team was finally able to unleash its full offensive potential, much to the chagrin of the opposing players on the other side of the field. The No. 3 Buckaroos racked up 569 yards of offense in the team's 66-18 victory over the No. 6 Crane Mustangs in the quarterfinals of the 1A State Playoffs on Saturday at McMinnville High School, putting St. Paul back in the semifinals for the second year in a row. It was yet another dominating victory for a St. Paul team that has blown out every team it's faced this season, but unlike in previous games, the contest was just close enough at the half — 36-12 — to warrant a rare second-half appearance by the Bucks' starters. "They were a good, physical opponent and our guys ended up playing almost the entire game, which we haven't done for several weeks, so that was good," St. Paul head coach Tony Smith said. The result was the most offensively balanced game the Buckaroos have played this season. The team's typically-sound ground attack was in full force on Saturday, punishing the Mustangs for 319 yards. But the Bucks were just as potent through the air, where quarterback T.J. Crawford was able to connect time and again with receiver Jaidyn Jackson, who finished the game with a season-high 189 yards and three touchdowns on six receptions. "It's hard to throw the ball when you're ahead," Smith said. "This is a really good opportunity for (Jackson) to play and TJ did a good job getting him the ball." Crawford also completed a pair of passes to Alex Dela Cerda for 49 yards, finishing the game with a robust 10-of-14 stat line for 250 yards. Coming out of the halftime break, the Bucks came ready to put the game away. Crane's first possession in the third quarter ended when Crawford picked off a pass near midfield and returned it 59 yards for a touchdown. St. Paul held the Mustangs to three-and-out on ensuing possession and rumbled back down the field in nine plays, scoring on a 10-yard pass from Crawford to Jackson to put the team up 52-12 after the two-point conversion. Crane was able to respond on their next possession with a touchdown drive of their own, but the Bucks held them scoreless for the remainder of the game and tacked on a pair of touchdown runs in the fourth quarter by Justin Herberger to bring the game to its final margin of victory. Herberger led the team on the ground with 172 yards and three touchdowns on 18 carries, while Crawford added 81 yards and a score. Although the final score was much the same as it has been all season, Crane's was able to put up 258 yards of offense and three scores against St. Paul's stalwart defensive starters. With the state semifinals looming, Smith said its only going to get more difficult from here. "I thought it was a typical quarterfinal matchup in what we've been telling our kids," Smith said. "The storm's coming." But the Bucks will likely have to weather that storm without the presence of all-state running back and defensive lineman Saul Martinez, who suffered a serious ankle injury during the contest. Smith was confident the team would be able to endure the loss of a key player, much as it has in previous injuries throughout the year. "We've gone through this, not with just Saul, but with multiple players during the season," Smith said. "We didn't have Francisco Vargas early. We didn't have Rawley Koch for large parts of the season. Zach Brentano, Steven Coppola." The Bucks (11-0) will have a difficult, albeit familiar opponent in the semifinals when they face the No. 2 Wallowa Cougars (9-2), who they beat 54-20 in the season opener on Sept. 31. While that game was a fairly one-sided win for St. Paul, Smith was cautious not to put too much stock into a three-month old victory. "I think sometime in those early season games, if you have a lot of success against a team, that actually makes that team better, because it exposes what they need to do differently against good teams," Smith said. "They make those changes and they get better in turn because of those changes. I expect it to be a very evenly contested game." 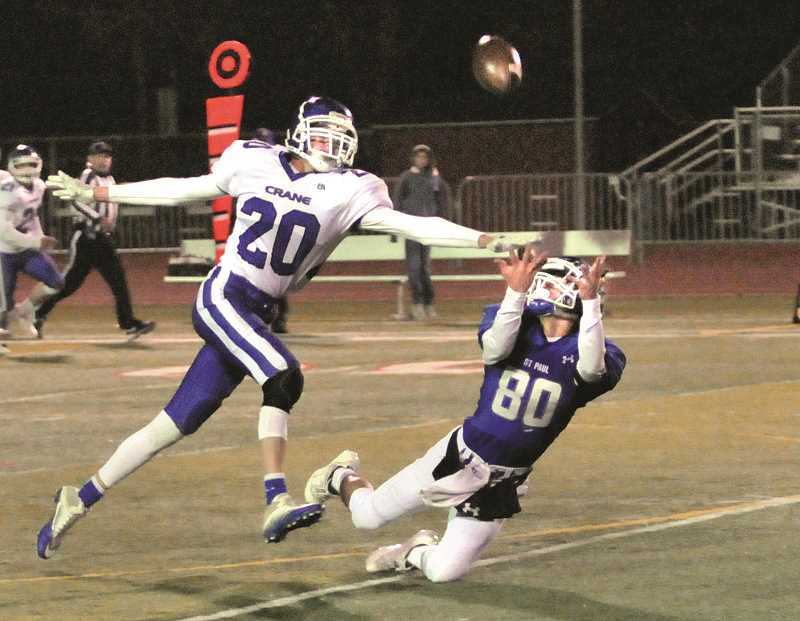 Kickoff for the 2018 1A Football State Semifinal between St. Paul and Wallowa is scheduled for noon at Hermiston High School on Saturday.